February 18, 2015 – Exactly 85 years after Clyde Tombaugh’s historic discovery of Pluto, the NASA spacecraft set to encounter the icy planet this summer is providing its first views of the small moons orbiting Pluto. The moons Nix and Hydra are visible in a series of images taken by the New Horizons spacecraft from January 27- February 8, at distances ranging from about 125 million to 115 million miles (201 million to 186 million kilometers). The long-exposure images offer New Horizons’ best view yet of these two small moons circling Pluto, which Tombaugh discovered at Lowell Observatory in Flagstaff, Arizona, on February 18, 1930. 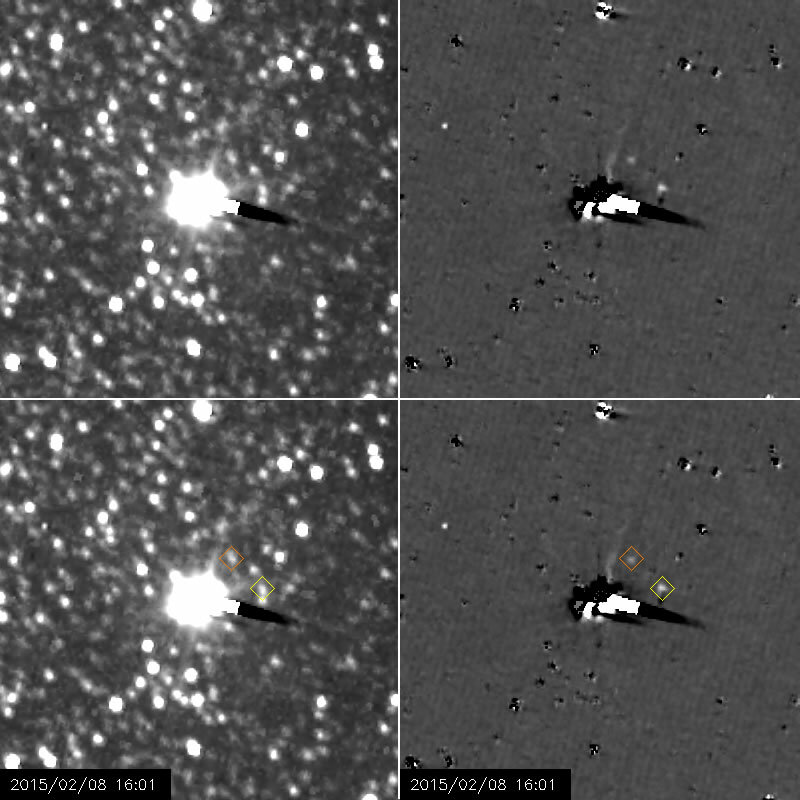 Assembled into a seven-frame movie, the new images provide the spacecraft’s first extended look at Hydra (identified by a yellow diamond) and its first-ever view of Nix (orange diamond). The right-hand image set has been specially processed to make the small moons easier to see. These are the first of a series of long-exposure images that will continue through early March, with the purpose of refining the team’s knowledge of the moons’ orbits. Each frame is a combination of five 10-second images, taken with New Horizons’ Long-Range Reconnaissance Imager (LORRI) using a special mode that combines pixels to increase sensitivity at the expense of resolution. At left, Nix and Hydra are just visible against the glare of Pluto and its large moon Charon, and the dense field of background stars. The bright and dark streak extending to the right of Pluto is an artifact of the camera electronics, resulting from the overexposure of Pluto and Charon. As can be seen in the movie, the spacecraft and camera were rotated in some of the images to change the direction of this streak, in order to prevent it from obscuring the two moons. The right-hand images have been processed to remove most of Pluto and Charon’s glare, and most of the background stars. The processing leaves blotchy and streaky artifacts in the images, as well as a few other residual bright spots that are not real features, but makes Nix and Hydra much easier to see. Celestial north is inclined 28 degrees clockwise from the “up” direction in these images. Nix and Hydra were discovered by New Horizons team members in Hubble Space Telescope images taken in 2005. Hydra, Pluto’s outermost known moon, orbits Pluto every 38 days at a distance of approximately 40,200 miles (64,700 kilometers), while Nix orbits every 25 days at a distance of 30,260 miles (48,700 kilometers). Each moon is probably between 25-95 miles (approximately 40- 150 kilometers) in diameter, but scientists won’t know their sizes more precisely until New Horizons obtains close-up pictures of both of them in July. Pluto’s two other small moons, Styx and Kerberos, are still smaller and too faint to be seen by New Horizons at its current range to Pluto; they will become visible in the months to come. The Johns Hopkins University Applied Physics Laboratory manages the New Horizons mission for NASA’s Science Mission Directorate in Washington. Alan Stern, of the Southwest Research Institute (SwRI), headquartered in San Antonio, is the principal investigator and leads the mission. SwRI leads the science team, payload operations, and encounter science planning. New Horizons is part of the New Frontiers Program managed by NASA’s Marshall Space Flight Center in Huntsville, Alabama. APL designed, built and operates the spacecraft.